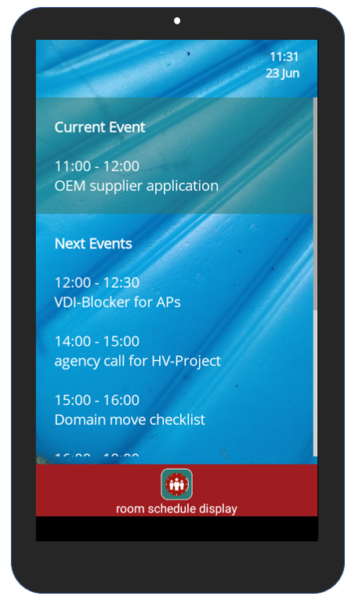 In a quick glance you can see the ongoing and upcoming events and availability of the resource. It assists you in locating the correct meeting room or finding a free room for scheduling a meeting. You can also use it to monitor your own schedule in real-time. Customize your digital signage display with the fonts, background colors of your choosing. 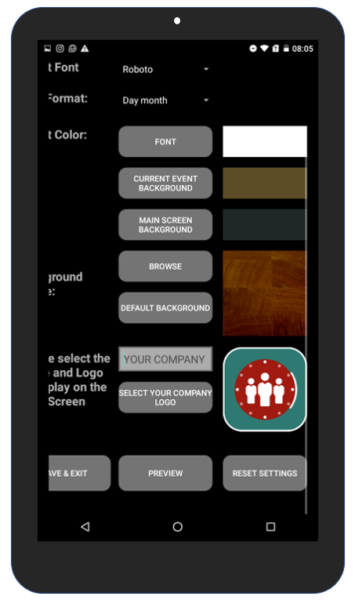 Adapt the display to match the theme of your company or your resource. 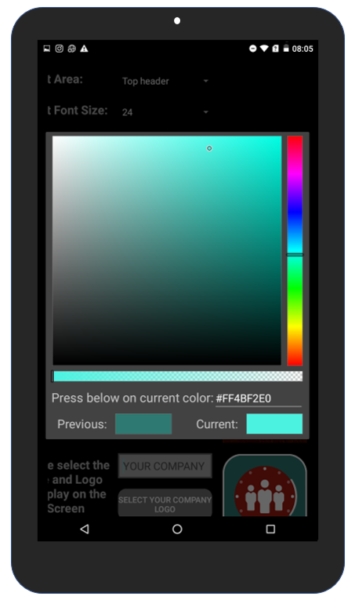 With the premium app you can also brand the display with your company logo and add background image . 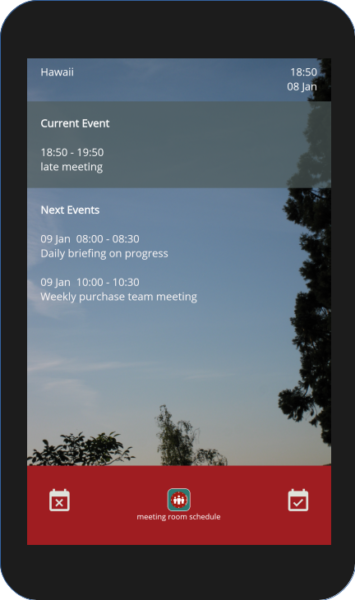 Meeting Room Schedule secures your digital signage display from any external interaction. Register and enable password protection and kiosk mode to prevent . 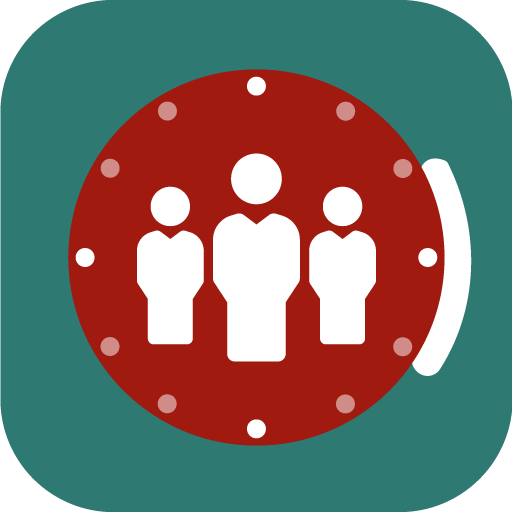 Reduce late starters and effectively utilize the available room resources by checking-in to the meeting in time. The room will be auto released if the host doesn't check-in. Manual release allows the host to make the room available if a meeting ends early. Did you locate a free resource and want to book it immediately? Spontaneous meetings can be booked on the spot from the schedule display tablet. Meeting room schedule allows you to display the meeting information in any language. With the premium subscription, you can define static headers like "Current Event", "Next Event", "Currently Available" etc in your preferred language along with the meeting information. 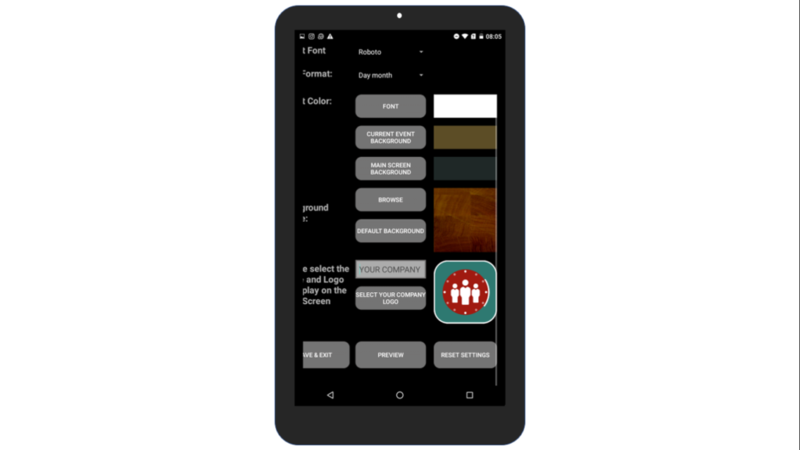 Meeting Room Schedule Free enables anyone in a company or organization to see the schedule of a resource or person instantly. It’s perfect for organizations where appointments are occurring on an on-going basis and schedule collisions are a part of everyday business life. Easily integrated with Microsoft Exchange (via asmx-link), Outlook.com, Office 365, Google calendar, local file in your Android device and Dropbox or any other File Server Address. Multi-language support for re-defining headers on main page in any language. Read our Quick-setup-guide for installation and set up instructions. Finally place the Android Device in front of the Meeting Room and enjoy it! If you have questions, check our FAQ and feel free to reach out!!! *Check Google Play for price in your local currency. Once installed, open the app and check options in welcome screen. Choose the Demo Server Display. The main display screen is now loaded with data from our demo server. You can play around the features to get a feel of what Meeting Room Schedule offers.You can connect to your personal/company calendar once you complete the registration process. Registration is mandatory for using Meeting Room Schedule to display your calendar data. You can easily register using a valid email address in few quick steps. Enter the email address, re-enter the email address and click on Register. You will receive a confirmation code in the given email address. Enter the confirmation code and click on Confirm Registration to complete the registration process. Meeting Room Schedule supports calendar data in diverse formats and sources. Hence, you can connect to MS Exchange, Office 365, Google Calendar as well any ICS files available in the device or accessible through Internet. First of all, if you already have a Microsoft Exchange account connecting to your calendar can be really quick and easy. Tap on the main display screen to get the navigation options. Go to the screen Settings > Calendar Connection and select the option Exchange . Clear the demo server settings. A resource can have a fixed schedule and without any real-time modifications. 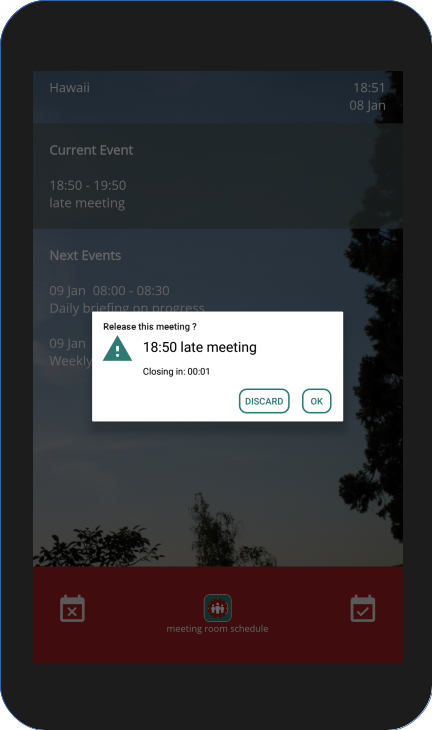 For such requirements, you can use Meeting Room Schedule to connect to a local ICS file. Since almost all calendar systems allows you to export your calendar data in .ics format, the data can be made available instantly. 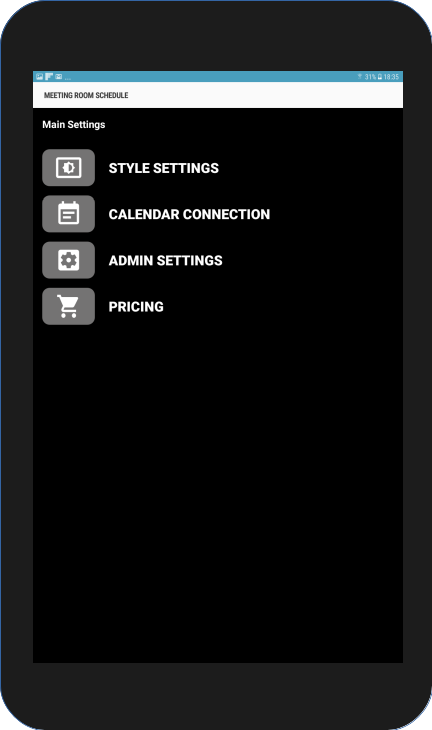 Go to the screen Settings > Calendar Connection and select the option Local. 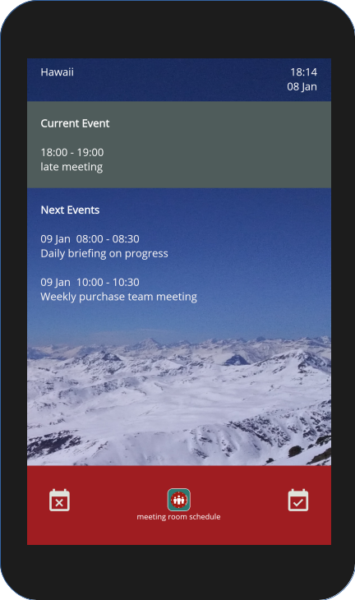 Meeting Room Schedule allows you to connect to any ICS file published at any folder location accessible over the internet. Therefore, you can connect to any ICS file saved in the Dropbox or to the .ics link for your outlook calendar. Go to the screen Settings > Calendar Connection and select the option Server. 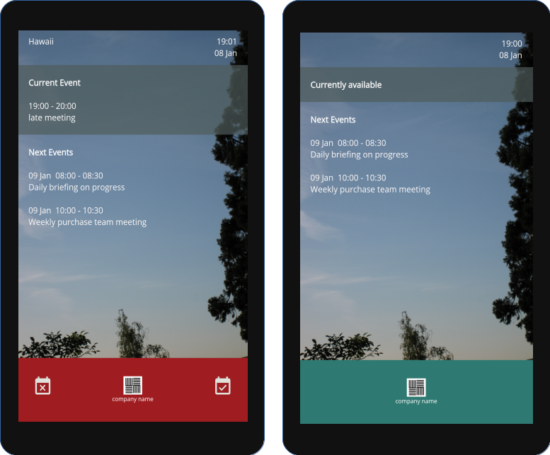 Meeting Room Schedule can seamlessly integrate your Google calendar data and display it on any android tablet display. You have to add the Google account to the device accounts For Meeting Room Schedule to be able to access the calendar. If you do not have the preferred Google Account configured in your device yet, you can do so in few simple steps as described here. To display your calendar data in Meeting Room Schedule, follow the below steps. Go to the screen Settings > Calendar Connection and select the option Google. Click on Select Account button and choose your Google account linked to the desired calendar. If you have not added your account still, you can choose Add Account option instead. Once your account is selected, the calendars linked to the account will be auto-populated. Click on Select Calendar button to choose the desired calendar. The data from the selected Google calendar should now appear on the tablet main display. 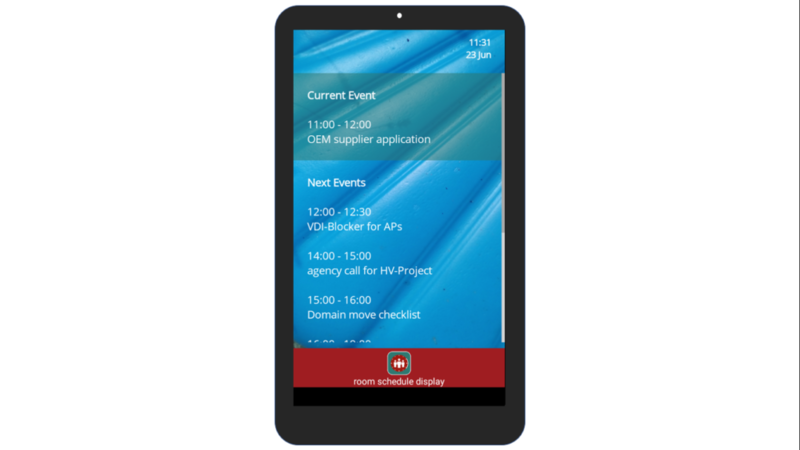 The Meeting Room Schedule offers various customization options to modify the display and tune to the needs of your tablet. Tap on the main display screen, to access the menu to proceed to Settings > Style Settings. 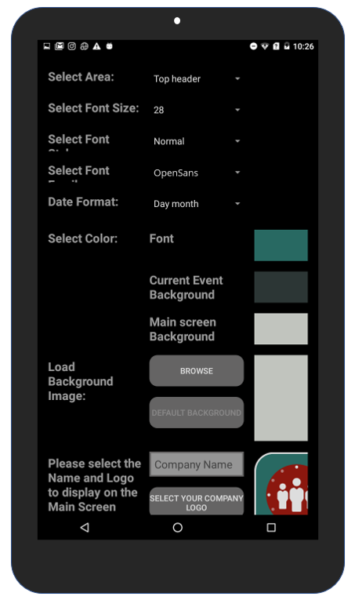 Here you can adjust the look and feel of the display as well as adapt the color scheme to your company theme. 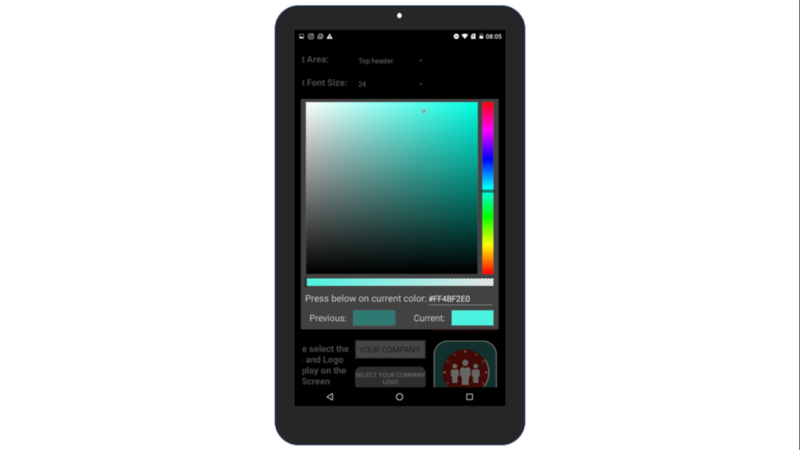 The free version of the app allows you to changes the font settings as well as background and text color for different sections on the main screen. 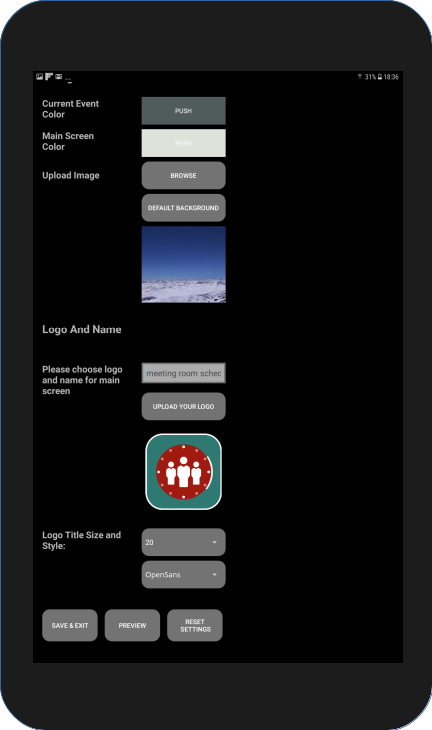 Further more, the premium version comes with the feature to upload custom logo and background picture. 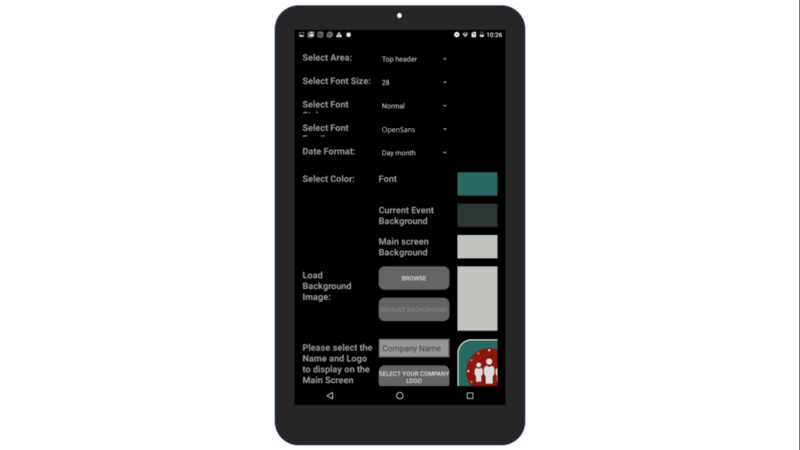 The app display can thus be adapted for your branding needs by enabling these customization options. Check-in and Release options are available in the premium version of the app. To activate check-in and release, you should have an active subscription. 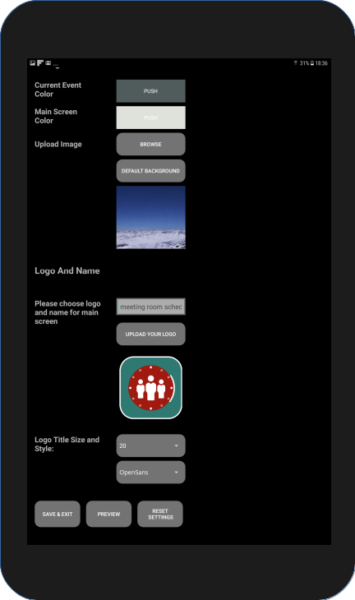 Once the feature is activated and enabled from admin settings, the check-in and release buttons will be displayed on the main screen. Time to auto-release option allows the admin to set a time after which the room will be marked as available, if the host does not check-in. Once subscription is active, go to Settings > Admin Settings. Enable the option Activate Check-in Procedure. 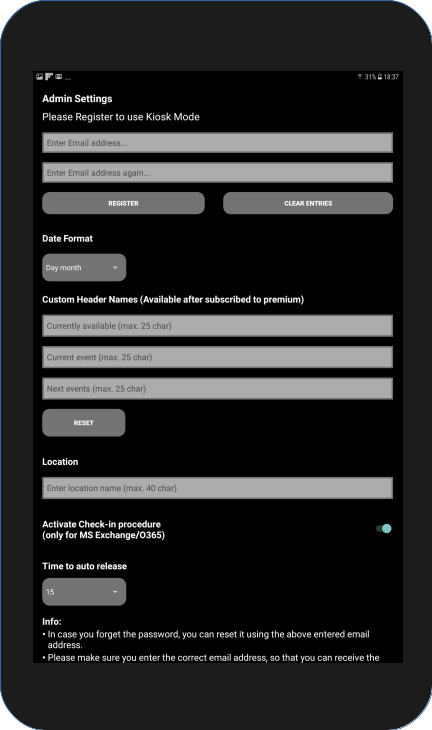 Set the Time to auto release as per your requirements. Now, the check-in and release options, when available, will be displayed for meetings in the main display screen. This functionality should be discussed with management prior to activation. Ask our support (link: support@scheduledisplay.com) for training documents. Book room now is a premium feature. Once your subscription is active, go to Settings > Admin Settings. Enable the option Activate Book Room Procedure. Now, the book room button will be displayed in the main screen (bottom right), when the resource is available and there are no other meetings starting in the next 30 minutes. Meeting Room Schedule allows you to display the calendar data in any language. 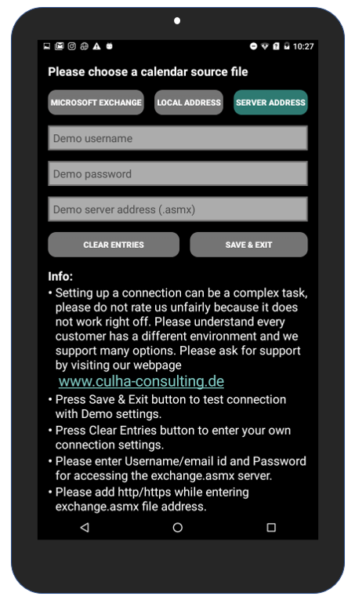 Additionally, with the premium subscription, the app allows header names like “Current Event”, “Next Events”and “Currently available” to be defined in any preferred language. Under the Custom Header Names section re-define headers in any language. The headers will from now on be displayed as defined in Admin Settings. Additionally, you can also define meeting room name in any desired language from Admin Settings and this does not require a premium subscription. Kiosk mode prevents any unauthorized interaction with the tablet display. Configure a password to enable kiosk mode and secure your device. After returning to main screen, you’ll be asked for this password to reach the menus again. If you forget your password, push “Reset Password” on the pop-up to get a new password sent to your registered email address. You can also change your password anytime under “Admin Settings”. Kiosk mode is now enabled in the tablet, therefore requires a password to modify any configuration as well as to exit from the Meeting Room Schedule.